Nutrition is the science that deals with the role of nutrients and other substances in food in relation to growth, development, metabolism and function, often in the context of health and disease. Pharmacology is the science of the study of drug action; a drug is a molecule which has a biochemical or physiological effect within an organism. Typically, in the context of pharmacology, the molecule (i.e., the drug) is used to treat, cure, prevent, or diagnose a disease or to promote well-being and is referred to as a medicine. It is important to note that many drugs are natural substances or derivatives of natural substances. It is immediately evident that there is likely to be some overlap between nutrition and pharmacology, since both are concerned with molecules that exert biochemical and physiological effects within the organism. However, in modern times, neither the teaching nor the scientific practice of nutrition and pharmacology have been considered to have much in common, and they exist quite separately from one another. This is different from earlier times, where the boundaries between these two academic disciplines were not clear and indeed may not have even existed. For example, many foods, food extracts and food-based potions have been used in traditional medicine to prevent and treat diseases and to promote well-being; this practice continues today in many, perhaps most, non-Western cultures. In other words, food can be medicine (i.e., a drug) and medicine can be food. Fortunately, the artificial barrier between nutrition and pharmacology is once more being removed. The pharmaceutical industry is becoming increasingly interested in food components as functional agents that have potential as drugs, while the food industry and nutrition scientists are expected to mainly adopt the practices of pharmacology and the pharmaceutical industry as part of their normal research and development activities. This blurring of the boundaries is likely to become greater over the next years, and will certainly increase the chances of new discoveries being made by both the food and pharmaceutical industries and of translating those discoveries into new products, new claims, new preventative strategies and new treatments for human disease. In the contexts of these changing research and regulatory environments “At the Crossroads Between Nutrition and Pharmacology” is a timely offering. It brings together a series of articles dealing with bioavailability and bioactivity of a range of natural substances found in foods, suggesting that these nutritional substances have properties that will make them useful in health maintenance, disease prevention and, in some cases, disease treatment. The disease contexts being considered include those that pose an ever increasing threat to the global population, including diabetes, metabolic syndrome and cardiovascular disease. Thus, the contents of this book are extremely relevant, making it the most welcome addition. 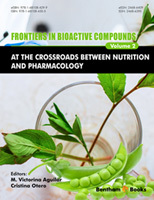 This is the first volume of this eBook series entitled “Bioactive compounds: at the frontier between Nutrition and Pharmacology”. Functional Foods are emerging in the modern food industry. But their potential for preventive and therapeutic treatments must be safely determined. This way the field of Nutrition will be transformed into a knowledge-based science for the development of Functional Food products. This eBook presents the state-of-the art and most recent advances in the computational design of Functional Food products, their sources, detection, analysis, extraction or synthesis and their different biological effects. The book presents the most important and recent advances in chemistry, technology and health research of products with potential use as drugs, nutraceuticals, functional food ingredients, or cosmetics. This volume will be a great value to students, clinicians, nutritionists R&D scientists and food companies. In Chapter 1, Younesi discusses the need of following the path of drug discovery and development to obtain new functional foods by the modern nutraceutical industry. He describes the potential of recent advances made by pharmaceutical stakeholders to evaluate the effects of bioactive compounds on human health. Targets identification for drugs and nutraceuticals are revised. Evidence-based modeling of the mode of action of functional ingredients influencing Alzheimer’s disease is presented as an example. The author describes how the fundamentals of systems biology and in silico target identification can be applied to the field of nutrition in support of the development of new functional food products. The most recent developments for the extraction, identification and quantification of bioactive peptides in foods are described in Chapter 2 by Puchalska et al. More than 2600 bioactive peptides have been discovered. They are specific protein fragments with favorable effects on human health, and their different bioactivities are described. The general workflow for their identification is presented and an overview of the most modern strategies for their recovery from food protein hydrolysates is given. This chapter covers from the standard analytical and electrophoretic methods to new alternatives for the identification of bioactive peptides in complex food matrices. These methodologies are essential for safety evaluation, establishment of health claims, policy and regulations. The concepts of bioavailability, bioaccessibility, bioactivity, bioefficiency and bioconversion of bioactive foods are clarified in Chapter 3. In vivo and in vitro methods for evaluating the bioactivity and bioavailability of foods are reviewed. Methods employed to provide scientific evidence on the effects of food structure, food composition, dietetic factors and food processing on bioactive foods, are described. Sugar fatty acid esters are another class of promising bioactive compounds with bioactivities such as antimicrobial, antitumor and anti-insect activities. These biodegradable emulsifiers are used in pharmaceutical, cosmetic and food industries. Ye and Hayes describe the most important synthetic routes for obtaining these biocompatible non-ionic and biodegradable sugar esters in chapter 4. This Chapter is also an overview of the bioactive properties of these sugar esters, including the comparison of the bioactive characteristics of sugar esters synthetized via chemical and enzymatic reactions. Li et al. analyzes the bioactivities of arabinoxylans in relation to their molecular structure in Chapter 5. Arabinoxylans -present in cereals cell walls- have several health benefits as mediators of physiological and immunological processes. Various in vitro immunological tests are discussed. This chapter also relates the molecular features of arabinoxylans to the different extraction technologies used to obtain and study them. Kumar in Chapter 6, describes the potential of indigenous medicinal foods, particularly the species of genus Dioscorea available in India as future functional foods. Some rural and tribal communities of wild Odisha base their subsistence on these foods, where they also play a critical role in their conventional medicine. Kumar studied the ethnobotanical values and bioactive compounds present in these tubers from the literature. Their potential as functional foods and for the formulation of new drugs is highlighted. In Chapter 7, Mantello et al. describes the important role of Nutrigenomics to identify key cellular functions by specific genetic and epigenetic interactions with a nutrient or a food component. Novel features of new nutrigenomic driven action plan strategy to develop specific pharmacological treatments for the reduction or prevention of diseases are described. In this chapter, the case of fermented papaya is presented as an example of functional food, with the most recent rational and evidence-based biotechnological progress. Chapter 8 reviews the most recent investigations on the anti-cancer properties of saponins as important bioactive components of medicinal plants, used in traditional medicine. The Examples of different plants, molecular and cellular mechanisms of their anti-tumor activities, and their prospective use to elaborate personalized nutrition are described. Chapter 9 covers the most important advances on the study of the effect of a diet based on different bioactive foods on the prevention and treatment of Diabetes. The bioactive compounds and the Mediterranean Diet (rich in this compounds) affecting glucose meta- bolism are described by Menacho-Román et al. In Chapter 10, Becerra-Fernández et al. describe the evidences of the antioxidants effects on cardiovascular diseases. They review cohort studies and randomized controlled trials that related the frequent consume of fruits and vegetables, and the intake of antioxidants supp- lements with the lower incidence of cardiovascular diseases. In Chapter 11, Pen et al. reviews the most updated and relevant evidences of the beneficial effects of bioactive foods on metabolic syndrome, which is known as the coexisting metabolic disorder that increases an individual’s likelihood of developing type 2 diabetes, cardio- vascular disease and stroke, as well as other chronic diseases. In Chapter 12, Brites gives a comprehensive review on Tauroursodeoxycholic acid and urso- and glycoursodeoxycholic acids with detergent properties for the treatment of hepatobiliary diseases, along with their mechanisms of action, their potential application in the prevention and recovery of diseases associated to the central nervous system dysfunction and pathology, and neurodegenerative diseases. In Chapter 13, Yartseva and Ivanenkov review the most recent studies showing the beneficial effects of some foods such as, natural phytochemicals in prostate cancer. This chapter describes the state of the art about the scientific studies focused on dietary polyphenols and analogs that have anticarcinogenic properties. Controversial results are discussed together with major issues of developing naturally occurring compounds into clinically used agents. In Chapter 14, the readers will find a rigorous description beneficial and deleterious effects of methylxanthines (caffeine and others) present in many foods and beverages. Factors that play a role in methylxanthine effects and metabolism are analyzed. This chapter summarizes the physiological and toxicological effects of these bioactive food constituents. Finally, in Chapter 15, the effects of different culinary methods used at present on bioactive food properties are described by García Viguera and Soler-Rivas. Positive and negative effects of traditional and the most modern technologies for food cooking or processing are presented and discussed. The editors are grateful to the authors for their excellent contributions and to Bentham Science Publishers for making the publication of this eBook possible. The Prevalence of chronic-degenerative diseases is increasing among the world’s population. Claiming 63% of all deaths worldwide, it is currently the world’s main killer. According to the World Economic Forum (2011), the total costs of these diseases were expected to rise upto $ 47 trillion by the year 2030. Interventions to reduce disease risks (for example, diet) would constitute the most economic, affordable and sustainable key elements for effective primary prevention. Since Hippocrates reported the aphorism “Let food be the medicine and medicine be the food”, there is strong evidence that reported links between diet and health. Healthy food actions are not only due to nutrients, but also to other constituents (bioactive compounds) with functional properties. These bioactive compounds are extranutritional constituents with beneficial effects and are typically present in small quantities in foods. They may promote optimal health. Actually, there are evidences of their effects on cancer, cardiometabolic syndrome, immunological system, nervous system, learning processes, sports performance. These evidences constitute new parts of the complex puzzle that is the Nutrition, in addition to demonstrating the permeability of the borderline between Nutrition and Pharmacology since these compounds can be used as drugs, nutraceuticals, functional food ingredients, or cosmetics. The relationship between bioactive food compounds and drugs is becoming closer. Moreover, bioactive products are considered as drug targets or physiological pumps and the technology traditionally used for drugs is being used to pioneer functional health ingredients from the bioactive compounds. There are varied papers about bioactive compounds in which the most appropriate technological treatments (synthesis, concentration or purification from different natural sources, including food derivatives) are studied. Innovative ingredients and their healthy properties both in humans or animals are documented. Therefore, there are many areas of interest. Because of all of this, in this book, the first in a series, the latest knowledge on the different chemical or technological facets of bioactive compounds and their nutritional and pharmacological applications in prevention and treatment of different nosological entities are collected. The first volume of this eBook series is a compilation of several well written reviews on the state-of-the art developments in computational design of compounds with functional activity, sources, identification, analysis, technological treatments effect, or biological action. “Bioactive compounds: at the frontier between Nutrition and Pharmacology” focuses on this important area of chemical, technological and health research. This book will also be a valuable resource of information for professionals in this field that allows them to see the news of the topic and its potential for preventive and therapeutic application with safety, quality and efficacy. This book has been possible by numerous co-authors for their collaboration to the task of synthesizing their knowledge on the subject in relatively concise chapters.